This second post about my life changing classes has been put off for too long. Last night, while laying in bed trying to sleep, I realized why. It's big and it's deep. The IGNITE: A Fearless Painting Teacher Training is going to be big, it's going to be deep, it's going to be powerful. How do you even put something like that into words? I have to start with a class that I took back in January. It is the very first and basic Fearless Paining class that Connie Hozvicka teaches. It's called BIG: A Fearless Painting Adventure. And big it is! "BIG is not just about painting BIG--it's about living BIG." 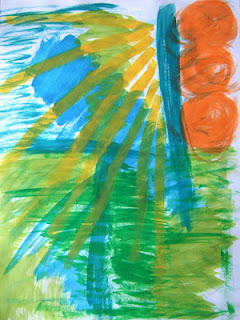 This way of painting, Fearless Painting, is all about the process and not about the product. Why paint if it doesn't matter what kind of picture you'll end up with? Don't you paint so that you'll have a pretty, appealing picture in the end? When it's all about the process of painting, you take the time to really listen. Those little whispers, those little urges, those little callings, they are what's important. If you follow them, they will lead you to a deepened connection. A connection to the innermost landscape of you. A connection to that wise center inside of you. 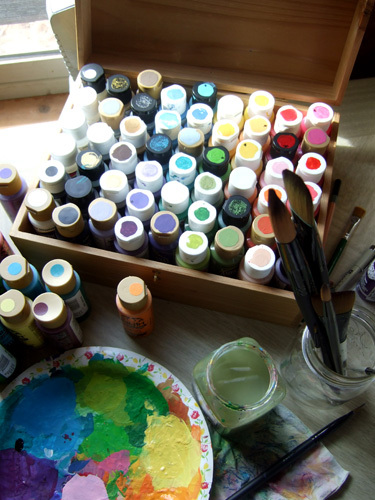 A connection to the very source of creativity. If you keep listening to and following your inner voice, your intuition, you will have a connection to the most beautiful life possible. Amazing things will happen. During my six weeks in BIG, my boundaries were pushed. My limits were challenged. My preconceived ideas and out-dated beliefs not just about art but also about life and myself were burst open and I felt a touch of the freedom that is possible when I truly follow my heart. We are encouraged to paint on really large paper, about 2 feet by 3 feet long paper. Some of the later pieces are even bigger than that having two or more papers taped together. This really helped me to think bigger and be more open, despite feeling stretched at first. 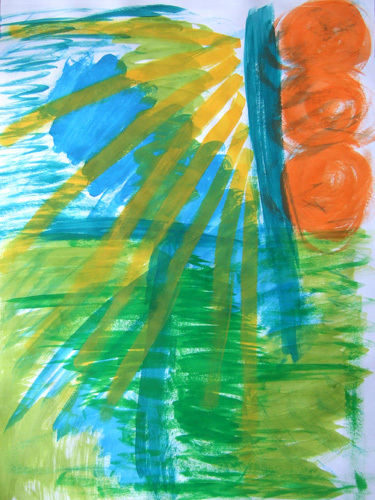 In Fearless Painting we are lead back to the very basics: scribbles, flowing lines, shapes, and painting with the complete carefree abandon that a young child paints with. If I ever get stuck I try to remember to just keep going with one of those and I'll get back in the flow again. When we first began experimenting with these basics, I was pleasantly surprised at what I learned through these "simple" exercises. It was okay to scribble on top of scribbles. It was fine, advantageous even, to pull myself out of small boxed in spaces and paint flower on top of them. I was taking my first steps toward listening and following even if it felt a little uncomfortable. I know that this process of listening to my inner voice and following it during the painting process has helped me to do just that in the harder areas of life. It's helped me to push through a little fear and discomfort here and there to pursue the callings of my heart. 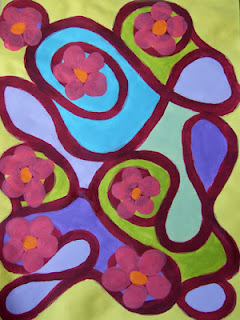 I started with some scribble, a light pink, but felt I should leave room to the left. I saw orange there so I went to town with orange scribbles. Soon it turned into a mesa. Blue followed and again I felt compelled to leave space to the left. I felt an elephant calling to that space. An elephant?? Eeek! So I painted a scribble field for her. Then a whole herd of elephants were calling for that space. 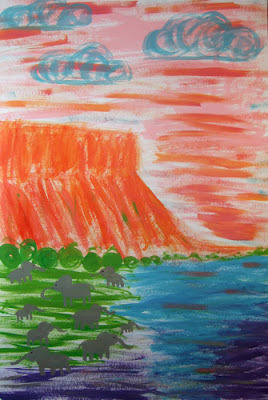 So I called on that child inside and painted elephants with light-hearted wild abandon. I found myself smiling at them. They're simple but I love them! I started out with the intention to just paint what my sister, Cari, and I "saw" through the front window on our very first road trip and see what would unfold. 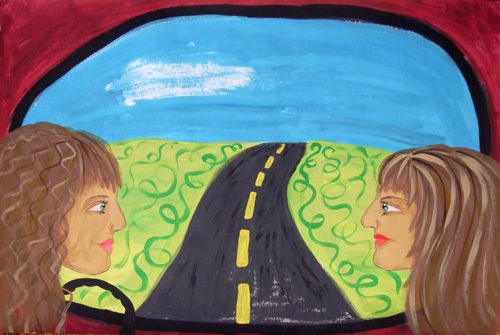 Well I felt compelled to paint my sister and I looking at each other. This was the first time I painted/drew a profile face so I ended up spending quite a bit of tedious time on those faces. I think I was listening but at the same time I was also concerned with getting it just right. (Even though they don't really look like either my sister or me.) I feel like I didn't paint as fearless as I could have on this one. Up close the shading on the faces almost look like wrinkles.. I think we'll will be road-tripping when we're old ladies! In looking at the sister piece and contemplating my next painting, in my mind the road became a tree. That might be a good place to start. Then I thought about how that painting had ended up focusing on my sister and I rather than what we were seeing out the window. That is what really is important to me, spending time with others in my life. Sure the destination is is great too, but I would enjoy time with others no matter the destination. 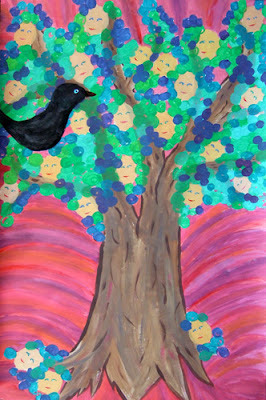 Then I saw faces in that tree that I planned to start my painting with. So I started with a BIG tree, then painted lots of little peach oval faces. I felt drawn to paint a couple at the foot of the tree. "At the bottom?? Did my people fall out of the tree?? Did they die and they're not part of my circle anymore?" I thought. I added them down there even though I was uncomfortable with the idea. I then added leaves, nice and green. Then it called for blueish and purplish leaves, so I added them. Pink and red started "shining" out of the trunk and between the leaves but not in a small clearing between the leaves on the left so I left that white. A black bird flew into that clearing. It was finally time to add eyes and mouths to all those faces. Some are happy some are a little reflective and the lonely face to the right of the trunk seems down right somber. This piece is 3 papers taped together making it 6 feet tall by 3 feet wide. A BIG Mama painting! I really had fun with this painting. I took a guided visualization before in which I saw a girl with one arm raised above her head. So that's where I started, with big flowing outline strokes. I felt she should be holding something so I just drew a line and then "bucket" popped into my mind. A bucket?!? Well okay, it went on the painting. I really tried to be completely open and let the lines flow. A fence showed up at the bottom and I felt the girl should be flying up and away from it. During the visualization, I saw a beach, so I put that in. Then I saw a dolphin jumping out of the water. The bucket started dripping something out but I knew it wasn't water. A tree called to the bottom right. I felt something needed to be to the left of the girl but didn't know what so I put in some circles. I had my basic outline. I started filling in the base colors. I wanted the girl's dress to match the bluebird but when I started with the blue, I ended up starting in the sky instead of her dress and didn't realize till half way through. I turned out to be fine though because I added a lilac color on top and it was perfect! My beloved red rocks showed up. The drops from the bucket started out as pink flower petals and I had way too much pink so I put it in the circles intending to come back later and change the circles. They stayed pink though and ended up being pink glittery bubbles floating up toward the bluebird. 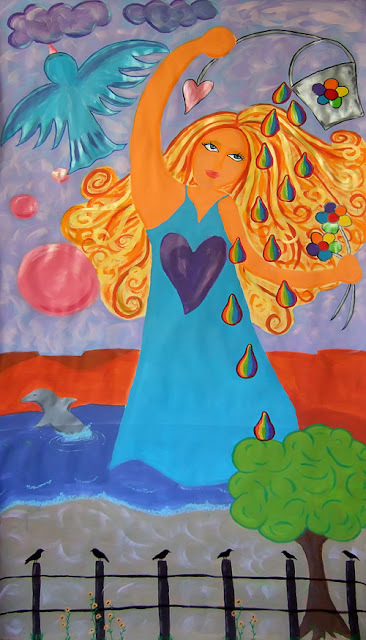 The flowers became rainbow flowers and the drips called for rainbow colors too. Toward the end, a bunch of ravens flew in and sunflowers grew up around the fence. I left the face and hair detail to the very end and was afraid that I would mess them up but was pleased with how they turned out. Fearless Painting is truly amazing. I've learned a lot through it and am beyond excited to spend more time in the process. IGNITE is a 10 month intensive class starting in October. I am delighted to be joining twelve other incredible women on this life changing adventure!